User Review: "Financial Edge NXT is a Timesaver"
Financial Edge NXT is used mostly by our foundation staff. We use it as our main accounting software. We use Raisers Edge for recording contributions and then integrate them with Financial Edge. This process is very easy as long as all your accounts are set up correctly. We would like to soon make Financial Edge NXT available for all of our advancement staff and some of our project directors. The challenge in this is being able to easily limit access to only the individual’s projects. I love the copy invoice feature. This makes for quicker entry of our invoices. The drill-down feature is also a plus when searching for a particular item. Being able to export tables quickly is a timesaver. At this time it doesn’t distribute negative entries to the correct project when there are multiple projects. This becomes a problem when you are trying to use a credit for one project but expenses invoice to a different project. The edit feature for imported journal entries is more difficult than in Financial Edge. The timeout feature logs you out too quickly. Financial Edge NXT has its difficulties just like any program but it has many positive features. Access online was a big plus for us, as was the copy feature for invoices, receipts, etc. Those features have proven to be big timesavers. It is easy to use and learn. I work for a Foundation at a college and our whole department uses FENXT. We use it for all of our accounting needs other than Purchase Order management. We use it in conjunction with Raiser's Edge to keep track of all incoming and outgoing money and also to manage the active funds our organization has. I love how well FE interacts with Raiser's Edge. This makes it much easier for our organization to stay current and increases our level of trust in the information we are seeing in both systems. The reporting features in FE make it easy to pull accurate information in a timely manner. I would like to see the price reduced. I work for a medium-sized non-profit and if the price keeps rising, I worry we will no longer be able to use FE. It is an incredible system to use, but if the price keeps rising, it will be difficult for small to medium-sized organizations to justify the cost. I would like to see error messages that contain more information. When our accountant runs the process to post gifts from Raiser's Edge, she typically is not able to easily understand the reason for the gift exceptions. It then requires me doing research in RE to find out what the error may have been from. I think FENXT is well suited for medium to large sized organizations who are willing to make an investment in their systems. I do not feel this would be worthwhile for small organizations or ones who do not prioritize their database systems. Review: "Financial Edge NXT was a pleasant surprise!" We have been using Blackbaud products for over 20 years and last fall we made the choice to upgrade to the cloud version for the entire school products. Upgrading to Financial Edge NXT was not the driver---the student information system was the driver---but we are reaping many benefits from the NXT environment. Since using Financial Edge NXT, we rarely utilize the database version as the majority of day-to-day activities can now be done in NXT. The benefits it has provided have been faster access to the system and more efficiency in our business office. We can get things done more quickly with the NXT version. Financial Edge NXT is very well suited for the school environment. User Review: "Financial Edge NXT"
We are a private school and use Financial Edge NXT for our daily accounting/finance operations. Very self-explanatory and easy to use. Adding a new invoice is fairly simple. Easy to add new vendors in the system. A variety of reportings available. Hope they quickly change to the web view faster, so we don't have to switch between web and database view. Financial Edge NXT is well suited for educational institutions. 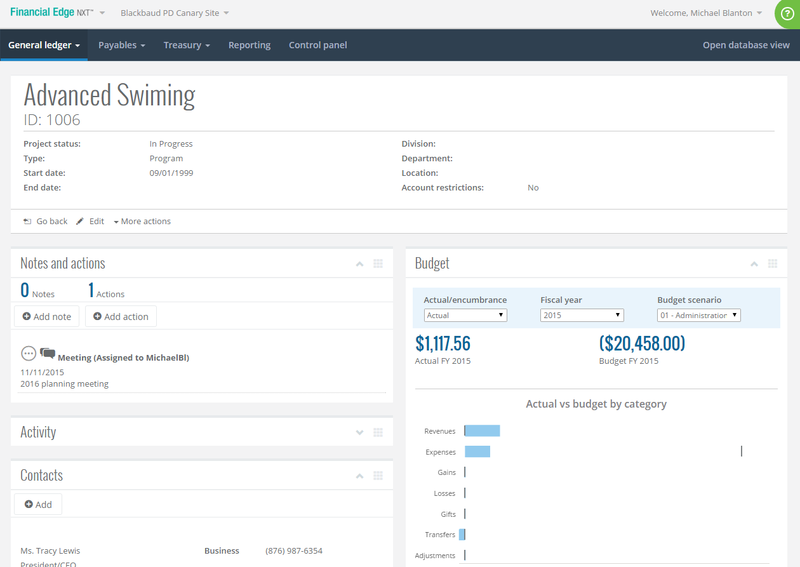 Review: "Financial Edge NXT was fine without the 'NXT'"
Financial Edge NXT is our database for accounting. Only the Finance Department uses it. It stores all of our Vendors, Invoices, and Payment records. It processes all payments we issue, including Check Printing, EFTs, and Bank Drafts. We use it to reconcile accounts, as well as provide all financial reporting to both management and program staff at large. GL configuration. We like the Fund-Account setup, with Project being a separate field not directly tied to the GL string. It provides more flexibility both with data entry rules/requirements, balancing requirements, and reporting. Bank feed. It is good to be able to download transactions and match them to the Accounts Payable bank register. Visual Chart Organizer. It provides extremely flexible and customizable report formatting, whatever GL configuration you have. NXT still has lots of glitches or missing functionality when compared with the database view. Many pages take too long to load, or just aren't as usable as the alternative in database view. Functions that are not available in NXT yet. There are still quite a few processes that are not yet available in NXT, which you must do in the 'old' database view. This makes it abundantly clear that NXT is not a new platform that was launched all at once, but rather a 'mirror' option that was haphazardly released in blocks (and still is being released in blocks). This process is awkward and can be rather unsettling to new users who are likely to spend months, and perhaps even years, as they attempt to figure out which of their processes they should do in NXT and which ones they should do in the 'old' database view. Reports, Queries, and Exports. Users who were already accustomed to the 'old' database view for these areas are likely to find NXT's equivalent options to be clunky and may prefer to stick to the database view for these functions. Some things just require more clicks when you try to 'simplify' by putting everything into one web screenshot. There's something to be said for being able to open different windows within a program, and like many other modern web browser-based programs, NXT gets in its own way in this regard. Provided this information in the following questions. Financial Edge NXT Review: "Love the functionality of NXT"
FENXT is being used by myself and other users across the organization in place of the traditional database view to the extent that the functionality is available in NXT. It is used for vendor and payment lookup, account activity lookup, payment posting and processing. One item missing is full functionality of the purchase order module. As soon as it works, I will use NXT to issue POs. It is a very user-friendly version of FE. Much easier to train staff to use and recover the information they are looking for. It is menu driven and intuitive. NXT is so easy to use and navigate. However it needs to be able to export all queries to Excel. It also is not 100% complete with all of the capability of the database version. Financial Edge NXT Review: "A robust system that could use a few more features"
Financial Edge is being used by all employees in the Business Office. Department heads have view-only access to look at their budget reports. The view-only access is better than the reports we sent them because they have the ability to drill into transactions from the report. Financial Edge NXT is great for working remotely. Pulling transaction details from a report instead of running a query is a plus. Creating journal entries and completing a bank reconciliation is more cumbersome in NXT and are better performed in the database view. FE NXT is being used by our accounting department as we try to migrate off of the client-server version to a SaaS environment. [It's being used by the] accounting department and some in IT with dashboards. NXT helps us eliminate using a Citrix environment for some of the FE use. Dashboards are easy to create and look professional. Learning curve from the client-server version of Financial Edge was minimal. Missing functionality, needs missing modules from the client server version or the DB view. Ability to edit users within NXT. It is as advertised. It will be a solid product when all modules are added. Financial Edge NXT Review: "Failed implementation..."
eliminate processing delays. Per our IT dept, the issue is not on our side. better follow up by implementation.... WE ARE STILL NOT IMPLEMENTED! renewal team wasn't aware of switchover and received billings for NON NXT renewals... took a long time to get resolved. Financial Edge NXT: "4c review of NXT"
We use Financial Edge NXT for high level review of transactions and attachment of accounts payable invoices. It is more efficient than the database version as far as drilling down and finding transactions. We only use the General Ledge and Accounts Payable currently. Like I said, the ease of getting around and drilling down for information is the best feature for us. It is great to have attached accounts payable invoices instead of having to search through an organization of folders to find an invoice copy. The hidden benefit is always being up to date on versions. We don't have to get emails notifying us of updates, forwarding those to IT and asking them to have our hosting company apply patches. Then we would wait and have the system down off hours before updates were applied. That's all gone now. We have to rely on the database version for Accounts Receivable. I'me not real sure about all the features. I know what I've got in the database view and so I live there. I would like to get into general ledger reporting and queues but the one time I tried, I couldn't get where I wanted to go so I gave up easily. We've had a couple of issues that came up for some reason because of what we use that apparently nobody else does, like having the many bank accounts we use show up in a drop-down menu. The software engineers have been good to fix those things, but it makes me feel like we are continually using a beta version of the software. It feels like Blackbaud is trying to get up to speed at their own pace and at the expense of users experimentation. NXT seems like a unfinished software product. We're too busy to experiment with a partially finished product with bugs and so we default to the database view. I think in the back of our minds that someday it will be a finished product. In the meantime there's no rush to move from the database view to NXT. Financial Edge NXT Review: "Frustration vs Satisfaction"
FENXT is being used as our Financial System, including Accounts Payable, Budget, and Payroll. I honestly can't think of one thing FENXT does really well. Since FE NXT is in the "cloud" it has been a really difficult transition as our company has some special needs that we finally got ironed out in FE, but then started the transition to NXT and now those special needs can not be met by NXT. Just logging in takes three more steps. Frequently the program logs out and we have to log back in. Payroll is more difficult than AP. AP is fairly smooth, but payroll is just now starting to go a bit smoother, but we heard there would not be anymore enhancements to the payroll module in the future, so our concerns will most likely not be met in the future. It's up to the clerk to figure out how to meet the needs of the employees. I can't think of any scenarios where it is well suited. AP module is working fairly well in the old style of FE. A co-worker is using the "cloud" version more often than myself. As I stated before payroll has been extremely difficult to conquer. This latest conversion to FE NXT is the third conversion for payroll in the last 3 years for us. First was ADP to Fundware to FE to FE NXT. We are actually now investigating other Payroll modules with other companies. Financial Edge NXT: "If you are looking for flexibility in reporting and access FE is worth reviewing"
We decided to go from FE & RE to the new NXT products for several reasons. Development officers can now access it remotely; we can log in from anywhere, we can have campus-wide reporting made available without the need to change each computer, reporting has more flexibility and auto bank reconciliation to name a few. We are new to NXT but have used Blackbaud for several years in our organization. Remote access is easy to use and so convenient. Development members can access funds and provide the most up to date information to the constituents. Access to project reports by our fund directors campus wide is something that we are working on implementing right now since the use of reporting is so accessible. 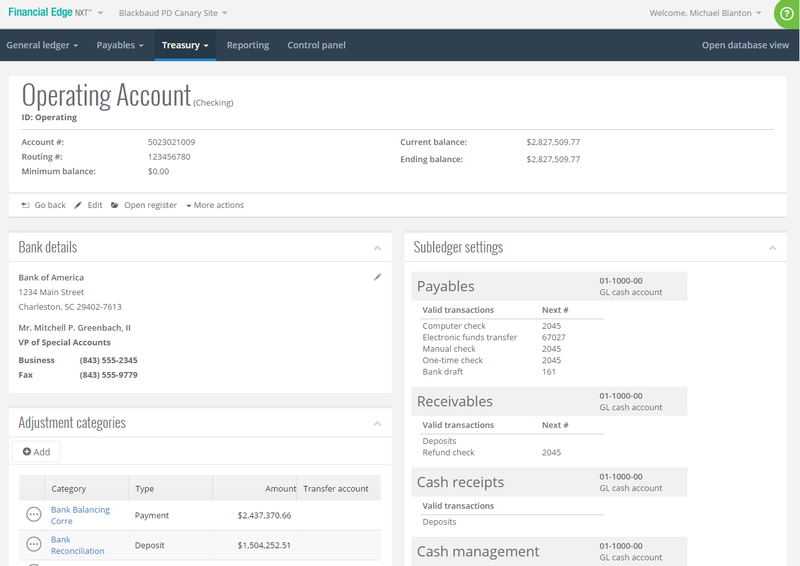 The bank reconciliation module is a time saver. Logging into the data base view could be streamlined for faster login. Create a system that would allow groups of invitations for FE NXT all at once. We have FE NXT view only for our fund directors and development officers across campus and the need to invite each one individually and not have the ability to set them up at the same time is very time consuming and inefficient. Our fund directors change frequently so this is definitely something that I would be interested in seeing an update completed. Ease of access is great but it also exposes the data if not controlled well with internal control implementation. If Blackbaud could provide a general guideline of helpful hints on set up that would be helpful to the person that is responsible for setting up users. Financial Edge NXT Review: "My NXT experience!" We use it only in the business office. We had planned to use it to keep track of our accounting needs on a daily basis. Which would include reporting, accounts payable, accounts receivable, student billing, etc I can't answer the question of What business problems does it address. It is a web-based program that can be accessed from any computer. The accounts payable tab......Why is the vendor info not have the option to enter invoices. It makes it very difficult to make changes when I have to refer back to a vendor. I have found that creating deposits are not as easy, too. I can't even find my "client" to enter my info, its all done individually like the AP tab. It makes it very hard to go back to refer to a specific deposit when it is not grouped by my clients. I have decided, after many days of frustration, trying to figure out NXT, that as long as the Blackbaud hosting services are available, I will continue to use that, so I feel that our costs to upgrade was a poor choice, but that is my personal opinion due the fact that I use this system on a daily basis. It is web-based, but for me, that really doesn't matter since I only access this program when at work. Financial Edge NXT Review: "Tweetybird"
We are using it through out the organization, but mainly accounting. All of the other departments uses it for entering their travel and creating requisitions for purchase orders. The CFO uses it for all of the financial reporting for the organization. I am new to using Blackbaud and still learning the system. Having the ability to create reports quickly. To void checks and the system creates your adjusting entries for you. Having the ability to review your accounts payable processing before printing your checks. The various links to get in touch with someone at Blackbaud is an excellent tool. The PO system. It would be great if there would be a section where you can breakdown various items from various departments, when you are placing your order into the system. Credit memos- once a check is voided and a credit memo is attached, how to remove it if there is several. Issues with the addresses once it has changed in the vendor file. When you are adding a vendor, "Lisa Fowler" the system would list her under the "L". So if I wanted to pull her up on the system. Normally it should be under "F" because of her last name but it would listed under the "L". It is well suited when it comes to posting to general ledger, where it does the adjusting entries for you. Financial Edge NXT is only being used by the Finance & Operations team. We use it as our accounts payable system & our general accounting system. I love the sidebar feature for accounts payable that allows you to see much of the details of the transaction without requiring you to open the full record. Being able to run a report straight to Excel is very useful & easy. It is nice to be able to search for vendors more easily than one could in Financial Edge 7. The journal entries are cumbersome to use. The view is "backward" from what I'm used to, with the most recent lines entered showing at the top of the entry. It is hard to review journal entries in the NXT view because only some of the lines (>5) show in each screen & then you have to click to get to the next set of 5 lines, etc. I often revert to the database view so that I can see the entire entry in one screen. There are no journal entry line numbers in the NXT view. This makes it difficult to find a specific line item & if you search for just that line you can't see the other side of the transaction. Again, I revert to the database view for most JE review & revision. The most useful & complex reports, such as the Statement of Functional Expenses, are not available in the NXT view. I find Financial Edge to be pretty easy to use. I like that you can include unposted transactions in reports. I find that the report building is easier in the NXT view but it did take some getting used to. We use it as our accounting ERP system for General Ledger, Accounts Payable, and interface to Raisers Edge. It's used by the accounting department and it addresses most of our accounting-related transaction and reporting issues. The attachment of scanned invoices and journal entries is valuable. The drill-down capabilities are easy to follow. The visual display of data on the monitor is good. The ease of using a cloud-based solution. Some of the features in Financial Edge 7 database are not yet available in FE NXT such as Fixed Assets and journal transaction history. Sometimes entries aren't posting in NXT but are able to post in FE 7 database view. The report writer doesn't display all of the reports that are being used and it's a little more difficult than in FE 7 database view. For non-profits it's very well suited if you're not consolidating entities. It's probably less suited in a manufacturing environment with multiple currencies and entities to consolidate. Financial Edge NXT Review: "It's okay, but will be great"
We use it as much as we can for the accounting functions. It is being used by the Business Office only. I like that it's faster than FE and more user-friendly. Doing a journal entry in FENXT is not user-friendly and not easy on the eye. It's much better in the database view. Needs more information on the drop downs when making selections. I can't wait for the budget module. If you used Blackbaud FE7 already, I highly recommend upgrading. It's not all there yet but new items are being released all the time. Financial Edge NXT Review: "80-20"
The whole organization uses FE-NXT and a sister software RE-NXT. Both programs allows us to track 30 different projects, three funds (unrestricted, temporary restricted, and permanent restricted), and 12 sizable grants with matching dollars (local, state, and federal resources). 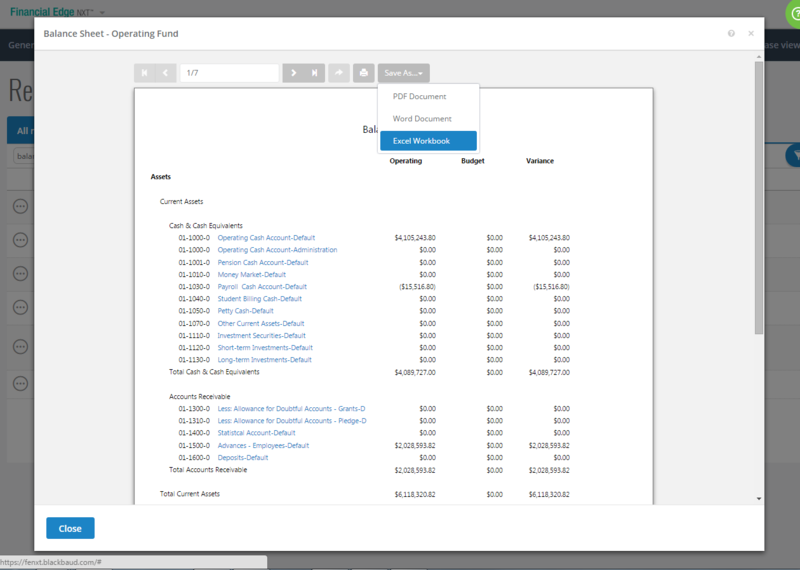 In addition, we can create income/loss statements for each project, fund, and grant for compliance reporting. FE-NXT is well suited for batching processes, but I would prefer doing financial activities in "real time" so the financial reports result in "real time". A good comparison is the accounting software titled Red Wing Controller. The FE-NXT software could be more user friendly, especially when it comes to creating financial statements. It is very tricky to remember which template to use when creating a financial report. Financial Edge NXT Review: "NXT - Becoming the next generation of non-profit accounting software"
Financial Edge NXT is being used primarily by the accounting department. We mainly use Financial Edge NXT to generate multiple reports simultaneously (a major improvement over FE 9). Going forward, we look forward to exploring more of the newly added features in Financial Edge NXT and beginning to implement them in our current processes. User Review: "Financial Edge NXT - It's worth it!" Financial Edge NXT is being used by the finance and administration team in our foundation. The main business problems that it addresses are easy access to reporting for executives and access to information in real time and from anywhere with a web connection. Financial Edge NXT provides beautiful, easy to read, and visual reports. Financial Edge NXT makes access easy for our executive through the various permission levels for access that it provides. Financial Edge NXT is still being developed, so not all of the functionality in Financial Edge (the database view) is available yet in NXT. Therefore users must have access to both the traditional view and the webview. Financial Edge NXT is suitable for organizations of all sizes. In fact, even though our organization is large, we only have two users for FE NXT. We have roughly 90 users of Raiser's Edge and RE NXT, however, and the integration between the two systems is valuable. Financial Edge NXT Review: "It's been a learning curve ..."
We implemented Financial Edge NXT at the beginning of this year (2017), and it is being used by our finance department. It has been challenging in the respect to our account manager (I believe we have had three so far). While the product is new to us, we have faced numerous questions and seem to have a problem with support and/or our account manager responding back to us. Many features are very similar to what we have used in the past and we have been able to problem solve a lot of issues on our own. The modules have many features that I think would benefit us, but we have not ventured to try and see how they work. Accounts Payable, which I use daily, is very straightforward and easy to maneuver around. Reports in Accounts Payable are what I need and are easy to use. Running a check run from start to finish is done with ease and hassle free. Accounts Payable Module is simple and user-friendly. Finding inputted data is a snap to find. Payroll in general is very difficult and cumbersome. I have never dreaded running our payroll before, but now it's a form of anxiety for me. Setting up new employees. We realize that each individual is unique, but setting up new employees has got to be easier. Reports versus queries. Still learning the system, but I spend a great deal of time trying to get only the information I need on a report. This is especially true of payroll reporting. The Accounts Payable module works and functions as we would like. Reporting out of Accounts Payable meets our expectations. The Payroll and General Ledger module(s) have been a learning curve with very little help from our account manager. There is always room for improvement and this would be the area we think Financial Edge should focus on. Financial Edge NXT Review: "It's Complicated"
Financial Edge is being used essentially across the whole organization, in conjunction with Raiser's Edge. We have two conference centers that are attempting to complete the entry of June data, as we are in the Home Office. We use all the modules except Student Billing, as we are not an educational institution. Accounts Payable has been a fairly easy module to learn, and I have used it successfully for nearly 4 months. It is fairly intuitive, once you learn the process. Payroll was quite an adjustment, but appears to give us more accurate data than our former software. We have been using it for nearly 5 months. General Ledger appears to be fairly easy to use, but since we have not closed our first month yet, that being June 2017, it remains to be seen. As we have yet to close June 2017, we have encountered many issues, had a multitudes of chats, and quite a few sessions where support has had to remote in to fix or gather data for engineers to fix issues. One issue unresolved is the accrual of leave in payroll. Engineers are still working on that one. Another issue that has FE folks stumped is the recording of manually entered gifts in RE not coming over into FE. We cannot close June until that is resolved. For some odd reason, my printer has disappeared twice from AP, to where I can't print checks. They had to get a duplicate of our database and fix it on their end the first time. Support had to remote in to correct the issue the second time - but it delayed paying bills significantly both times. We had an issue with Pennsylvania local withholding taxes that never got resolved. They gave us a work-around, but I will have to go into dozens of W-2's in January to move the taxes to the correct box. Can't wait. Honestly, at this point, I am not inclined to recommend this software. It was never explained to us the magnitude of labor and cost that would be involved to get it up and running, and we still have yet to close June 2017, here at the end of October. Financial Edge NXT Review: "Improvement"
Financial Edge is being used as our main Accounting system. We use it to reconcile accounts, enter A/P and A/R. General Journal entries and cash deposits are accounted for in our Accounting department. Finding transactions with the searching engine is quite easy. Ability to reconcile accounts easily. Search for check #'s is not hard. Entering invoices that have the same invoice number. Allowing for two or more to enter an invoice and be able to make changes at the same time. Fix bugs and screen freezing. It is well suited for our small Accounting department. However, we don't use it to perform financial statements, since it does not give us detail as to where the numbers are coming from. We would like to have more detailed financial statements and be able to pull up the information as to where the numbers are coming from. Financial Edge NXT Review: "Love FE"
We currently use Financial Edge across our organization. We currently serve four entities (3 schools and our network), therefore, we run/track individual transactions and reports - but also run consolidated reports. FE addresses all of our finance and accounting with the exception of payroll and student billing. Because we run four separate entities, FE allows us to allocate transactions to each of the entities. This allows the ability to look at each entity separately as well as look at the organization at a consolidated level. FE tracks interfund entries well. There are some nuances in FE that can stand to be improved upon - nothing that will discourage me from using FE, just things that would make it easier to navigate through the system. For example, navigating between modules could be improved upon. Having the ability to navigate through the system while reports are running should be an option. FE is hands down the best accounting software that I've ever used. The functionality and reporting requirements for non-profits is handled well in FE. Financial Edge NXT Review: "FE NXT - I'm a fan!" We are using FE NXT in our philanthropy department. It addresses the problem of our finance department not tracking project balances and expenditures. 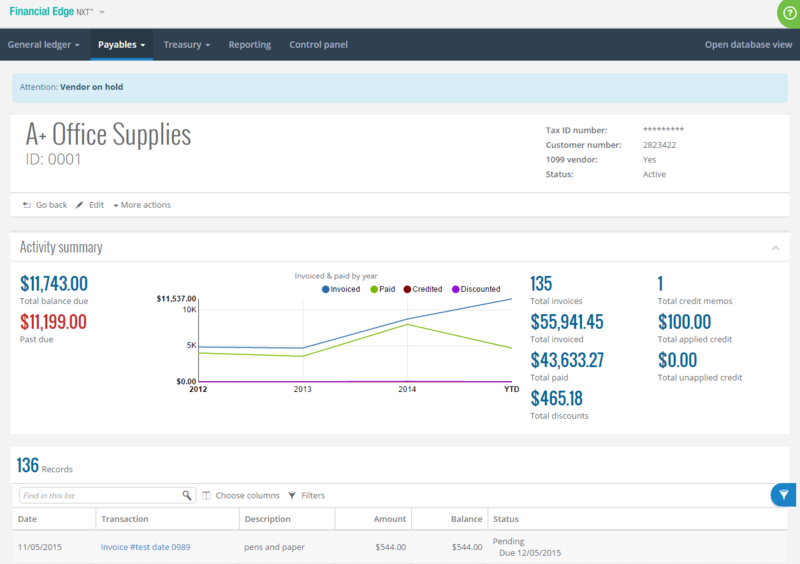 Financial Edge NXT is a cloud accounting solution from Blackbaud that is designed to provide transparency across teams, security, compliance, and reduce the need for manual processes. The system is a fund accounting solution that provides a general ledger, projects, grants, endowments, accounts payable and receivable, fixed assets, banking, and more. This solution includes a personalized dashboard and customizable views. Financial Edge NXT enables users to closely monitor income statements, program-to-expense ratios, cash balances, and other key metrics. 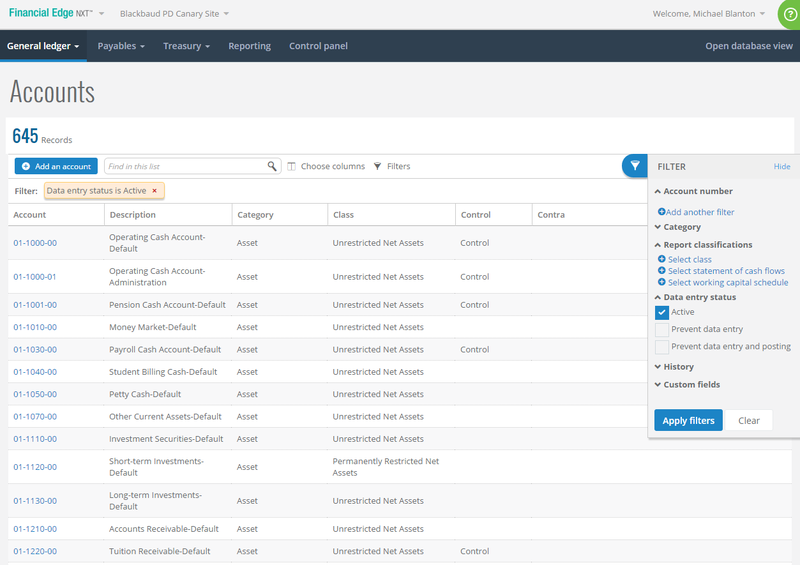 Financial Edge NXT offers real-time reporting, with one-click drill-down functionality and export capability, to enable data-driven decisions in real time. The system allows users access to grant and project accounting that allows for streamlined management of budget, as well as a way to effectively monitor accounts and generate reports. The vendor’s value proposition is that by using Financial Edge NXT, nonprofits can reduce dependency on manual processes, thus improving data entry accuracy.